Some of you may have noticed, most of you probably didn’t, that we skipped our annual anniversary/state-of-the-blog/thanks-for-your-support/request-for-donations post in mid-December. We always write this post around December 15th, because this is the date when we published our first article back in 2012. I hope you’ll believe I’m not fishing for sympathy or affirmation when I say that we weren’t feeling terribly deserving of a celebration in mid-December for a myriad of reasons. So we quietly turned 5 and for the most part, we decided to leave it at that, save for this brief post that we hope you’ll take a few minutes to read. First of all, we’d like to say thank you to all of our readers. Five years ago we were averaging about 50 readers a day and most of those readers were related to us. We have no doubt that much of our growth over the last few years can be attributed to the fact that you all have shared our articles via word-of-mouth, email, and social media. Thank you also to those of you who have offered us encouragement and positive/constructive feedback over the years. This website is a labor of love, but it’s also a money pit. Sorry if it’s crass to mention money, but we want you to know that in many ways this website continues to exist only because of your support and good vibes. Finally, thank you for your willingness to share your experiences and to support your fellow readers. We are humbled by the stories of pain and heartache that are shared on this site every day. Each and every comment is a reminder of just how raw and complex grief is. We publish articles on a weekly basis, so each week we have one shot to offer you something helpful. The reality is that each week we do right by some of you and we fail the rest. We know this because many of you tell us. For example, a handful of you will say to us “This is exactly what I needed” and a handful of you will say “You’re wrong, you don’t know what you’re talking about!”. I’m not going to pretend it isn’t frustrating because in a perfect world we’d love to be helpful to all people all the time, but that’s not possible. We know that only a small percentage of articles will ring true for most people and if we truly believe that individual grief is unique, then it follows that the different types of support individuals will find helpful will be as well. I will tell you that in 2018 we are unapologetically dedicating ourselves to leaving no stone unturned with regards to the topics we cover. Some topics will broadly resonate and others will not. We invite you to email us or comment below with topic suggestions and questions. We will continue to address many of the topics on this site and we will also add them to our list of potential podcast topics and e-course topics. As we move forward we ask you to respect our attempts to cover a wide range of topics and to join us in honoring and learning from our differences when it comes to grief experiences and coping. You have our promise that we will approach all grief – yours and everyone else’s – with open and accepting hearts and minds. The longer we work in this field, the less we presume to know about anyone else’s sufferings. Our personal knowledge of your specific ache is extremely limited, so we will never tell you how to grieve. We won’t always have all the answers, but we will always support you in your quest to find your own truth and peace. We will always offer suggestions for coping and we will always try and help our broader society to also have more open and accepting hearts and minds. In 2018 we will begin in-person training for individuals and professionals who are located in the Baltimore area. Our first in-person session will be held on January 9th. If you live in the area, we encourage you to check out our upcoming events. If you don’t live in the area but would like to bring us to you, here is information on our training and workshop sessions. Just as a reminder you can also follow us on Facebook, Instagram, Twitter, and Pinterest. 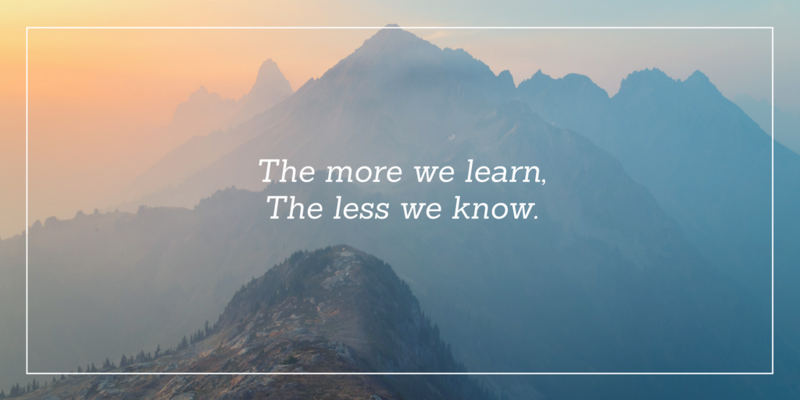 21 responses on "The more we learn about grief, the less we know"
Great!! you both are the salt of the earth. Your blog was very teach me for supporting the mothers who suffer from pregnancy loss. I would like to suggest an idea that you can cover : when the mother tell us why God chose me for this happen? what do we tell her about this? I came across this site sometime after my “acute” grief phase ended. But in a new phase – which meant I have become the person caring for the grieving! This blog helps me to process what happened, my reactions and some of the hows and why’s – including understanding where others might be different to me. Thank you for all you do to elevate the discourse around grief; as a bereavement counsellor I find your website an invaluable resource. Thank you so much for all you do! I have learned so much from your articles, podcasts and the photography course that I took. I appreciate you. Thank you ladies for all the information and healing that you provide. This has been the worst time of my life losing my mother, best friend and my husband within 3 months. I know and appreciate all your articles and blogs. Thank you for caring so very much. best, teaching us all to be open about something that is often hidden. Love to you both. I only discovered you this autumn, through a friend and happily paid $100 for the photography course offered. It is SO much more than I expected, enriched by technique, artistry, and grief experiences. I highly recommend it, for personal support and for financial support to the greater cause. “Grief is bespoke,” wrote Author Max Porter. Learning to navigate our personal journey when no one else has taken the exact same path before is hard, but this site helps offer some light to step forward. You are a treasure and a great help in understanding grief and helping us walk through recovery. Keep up the wonderful work! Dear WYG team, It has been over two years since we lost our son to addiction and suicide. One of the very most helpful things over this period has been your blog. How fortunate for us that it had just come into being when we suffered this loss. As you said, not every post can help every person every time, but this process of grieving keeps changing, so there is an endless need to stay open to different ideas. Thank you both so very much. Please do not ever get discouraged. Thank you for all that you do! WYG has been immensely helpful to me personally and professionally. I am currently enrolled in a Thanatology program and have referenced many articles from WYG in my coursework. I have found great support for my own grief through so much of what you offer. I appreciate the great variety of topics covered. You have created such a welcoming and authentic space for visitors. The depth and quality of the work is just incredible. Huge fun! Thank you for sharing information. I belong to a group here in Washington state called WICS (Widowed information & Consultation Services)http://www.kcwics.org/. I joined this group after my husband died and I attended the hospice grief counseling. This group meets once a week and has helped me greatly. I now volunteer to help facilitate his meeting in a rotating schedule. There is always a facilitator and an assistant each week within a trained group of people. I am often looking for a topic to use during the meeting and real a lot online in order to help with this. When I joined this meeting 4 years ago there were 12 to 15 people and now we average about 25 people each week. I am grateful for all the support from this group and the friends I have made. I know many people do not have the opportunity to go to such groups and for that I am grateful for information such as you provide. This site has helped me immensely over the past year since my loved one died and I am so grateful you are here as well as all the readers who have commented. It has been such a difficult year–the worst year of my life–but having the support of others has made it more bearable. A possible topic is grief over the death of an estranged father (or other family member). I didn’t receive any support from my mother, sister or boyfriend/future ex-husband because they didn’t think it would bother me due to the estrangement. That was 20 years ago and I worked through it a long time ago, but it was certainly a confusing and heartbreaking time for me. That was a foreshadowing of the loss I experienced last year since I received no support then either. My family likes to ignore the difficult aspects of life. Talk about the weather and the price of gas are their main conversations. Thank you again for your commitment to this site. You are very much appreciated. Well, you wanted to know what other topics you might cover in future…so here’s one idea. How about the very difficult grief that ensues from a troubled, or even failing, marriage relationship? Yet another area where support is usually not to be found, or is the wrong kind of support that only leads to more heartache and often more damage as well. Like others have said, bless you ladies for all your hard, dedicated work!! And Happy 5th Year!! Deb, my husband of 54 years ended his life a month before you wrote your comment. My grief differs from my children’s because our marriage has been terribly sad and stressful for the last 15 years. I was ready to leave. I grieve the lost good years but I don’t want my children to think badly of their father for all my bad years. Suicide feels so shameful. Fortunately, I feel no guilt because I begged him to get help for his depression and he wouldn’t. It really was his choice. Now I’m grieving my choices that led me to be such a mess at this point. It is very complex and confusing besides painful. I hug you on your journey and wish you peace. Ladies, Thank You. Since the 2014 loss of my eternal soul mate your efforts have helped me gain insights into my then current situation and into what potentially lies ahead. Like you stated, not all articles will resonate with everyone coping with grief or those trying to assist others to cope. Nonetheless, the bottom line benefit of your efforts is greater than the sum of all your articles. Thanks again; Happy Birthday. I would really be helped by an articles on bitterness/anger and acceptance. I am towards the end of my grief journey, am no longer actively grieving my loss, but am still dealing with negative effects of my more intense grief period that I’m not sure how to go through. Bless you for trying and caring! I appreciate everything you do to ease our suffering! Thank you! !